[135 Pages Report] The global alumina trihydrate (ATH) market was valued at USD 1.48 Billion in 2017 and is projected to reach USD 1.99 Billion by 2023. The alumina trihydrate market is expected to grow at a CAGR of 5.7% during the forecast period. For company profiles in the report, 2017 has been considered as the base year. In cases wherein the information is unavailable for the base year, the years prior to it have been considered. The research methodology used to estimate and forecast the global alumina trihydrate market began with capturing data on key vendor revenues through secondary sources, such as D&B Hoovers, Bloomberg, Chemical Weekly, Factiva, and various other government and private websites. Vendor offerings were also taken into consideration to determine the market segmentation. 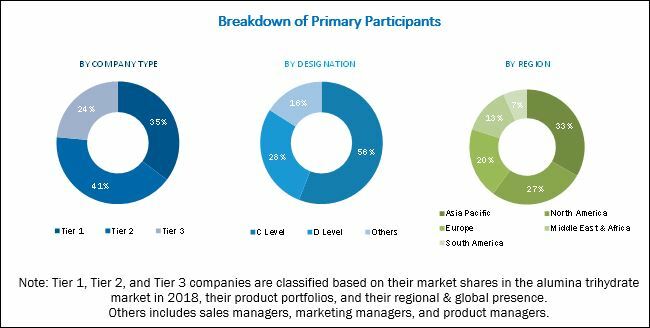 After arriving at the overall market size, the total market was split into several segments and subsegments, which were later verified through primary research by conducting extensive interviews with key personnel, such as CEOs, VPs, directors, and executives. Data triangulation and market breakdown procedures were employed to complete the overall market engineering process and arrive at the exact statistics for all segments and subsegments of the market. The breakdown of profiles of primaries is depicted in the figure below. 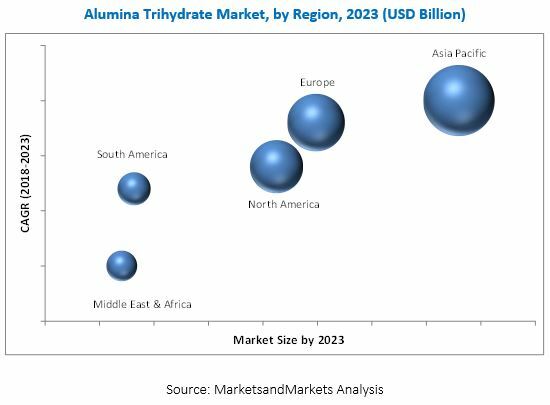 The alumina trihydrate market has a diversified ecosystem of upstream players, including raw material suppliers, along with downstream stakeholders, vendors, and government organizations. Companies operating in the alumina trihydrate market include Albemarle Corporation (US), Huber Engineered Materials (US), Nabaltec AG (Germany), and LKAB Minerals AB (Sweden), among others. Scope of the report: This research report categorizes the alumina trihydrate market based on end-use industry, application, and region, and forecasts revenues as well as analyzes trends in each of the submarkets. Detailed analysis and profiles of additional market players (up to 5 companies). The alumina trihydrate (ATH) market is projected to grow from USD 1.51 Billion in 2018 to USD 1.99 Billion by 2023, at a CAGR of 5.7% from 2018 to 2023. Alumina trihydrate, also known as aluminum trihydrate/aluminum hydroxide, is crystalline and a non-abrasive powder, which is obtained from bauxite using the Bayer process. One of the important properties of alumina trihydrate is that it is amphoteric in nature, thereby making it suitable for different applications. Alumina trihydrate is widely used as a flame retardant and a smoke suppressant. In addition, it is also used as a raw material to manufacture calcined alumina, Poly Aluminum Chloride (PAC), aluminum sulfate, sodium aluminate, aluminum nitrate, and alumina. Based on application, the alumina trihydrate market has been segmented into flame retardant, filler, antacid, and others. The flame retardant segment is expected to grow at the highest CAGR during the forecast period due to the growing demand for flame retardant for fire safety in various applications such as wires & cables, and plastics product, among others. Alumina trihydrate is used as a filler in polyester resins, epoxy coatings, and urethane used in plastics, among others, owing to its high thermal conductivity and excellent fire retardant properties. Alumina trihydrate has smoke suppressant properties, thereby enabling smoke reduction on burning. Based on end-use industry, the alumina trihydrate market has been segmented into plastics, building & construction, paints & coatings, pharmaceutical, glass, rubber, and others. The plastics segment is estimated to account for a major share of the overall alumina trihydrate market in 2018. Urbanization and the need for fire safety are factors leading to the increased demand for plastics. The consumption of alumina trihydrate as a flame retardant is high in the building & construction sector. The growing building safety awareness among masses has led to the development of energy-efficient buildings. As such, conventional plastics in these buildings are continuously replaced with flame retardant plastics. Alumina trihydrate is used in the building & construction industry in adhesives, wires & cables, sealants, caulks, roofs, counters, and solid surfaces, among others. Asia Pacific is expected to be the fastest-growing market for alumina trihydrate during the forecast period. Countries in Asia Pacific have huge prospects for the alumina trihydrate market due to the growing application of flame retardant in various end-use industries such as plastics & building & construction. The growing concern regarding thermal stability of alumina trihydrate in high-temperature applications may restrict the growth of the alumina trihydrate market across the globe. The thermal decomposition of alumina trihydrate begins at approximately 2200C in applications such as thermosets and certain PVCs. As such, alumina trihydrate is not suitable for applications with temperatures above 2200C, thereby restricting its use in high-temperature applications such as polyolefins. Key players operating in the alumina trihydrate market include Albemarle Corporation (US), Huber Engineered Materials (US), Nabaltec AG (Germany), and LKAB Minerals AB (Sweden), among others. These companies focus on investing in capacity expansions of plants to grow in the alumina trihydrate market. 10.10 Mal - Magyar Alumínium Termelõ És Kereskedelmi Zrt. 10.11.2 Jinan Chenxu Chemical Co., Ltd.